Hey guys i would love rapid fire but struggling to get it setup on my Cyborg R.A.T 9. Ive read there is some external software you can use to make it work. any suggestions on the best software? with o assigned to r1 (fire), and p the macro trigger. Press p to start/stop the macro. Replace o and p with the keys you want, and adjust the delays to your liking. i want to use my mouse button left for the rapid fire. it didnt work! im assuming mouse buttons arent acepting macro's? Only keyboard macros are supported currently. 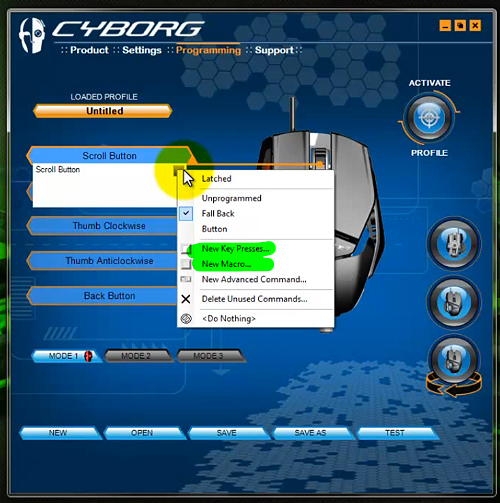 But on a related note, aren't the Cybord R.A.T mice highly configurable not only physically but software wise as well? If you're using Windows this should be no problem at all except most likely having to use the replacement SDL.dll (for virtual device support) if I'm not mistaken. I created issue 174. This is low priority for me, I will see if I can fix it for the next update. I don't recommend to use the alternate SDL.dll as it doesn't provide raw events. The mouse precision will be lower and the sensitivity conversion may not work because of the windows mouse ballistics. tried all sorts of things to get cyborg rat 9 mouse to rapid fire. it works but not with the left mouse click. cant seem to get it to work, if any one has any input id be very grateful!